Wanås Castle, portions of which date back to the 15th century, has been home to the Wachmeister family for eight generations. Thanks to its mix of bucolic setting, historic architecture, and cutting-edge art, the Swedish estate known as Wanås has become a destination for art lovers from around the world. Now a smart new restaurant and inn are giving more travelers reason to make the trip. On a chilly mid-April morning my three young children and I were in rural southern Sweden, tramping along a dirt path through dense woods of pine and beech. Suddenly, the sporadic birdcalls were interrupted by the incongruous sounds of electronic music. "Did you hear that?" asked one of my daughters. We all nodded, continuing toward the increasingly audible strains of dreamy techno-pop. Reaching the top of a low ridge, we found ourselves looking into a clearing inhabited by strange, candy-colored sculptures of insects, acorns, and leaves arrayed on a mirrored floor. With reflections of the surrounding greenery beneath them, this coterie out of Alice in Wonderland melded surreally into the forest. "Cool!" yelled my oldest as she ran ahead. For the next 10 minutes, we shimmied and spun around the space to hypnotizing beats seemingly piped in from the tops of trees. As we later learned, the trippy middle-of-the-woods disco is an installation titled In Dreams by Berlin-based artists Nathalie Djurberg and Hans Berg. 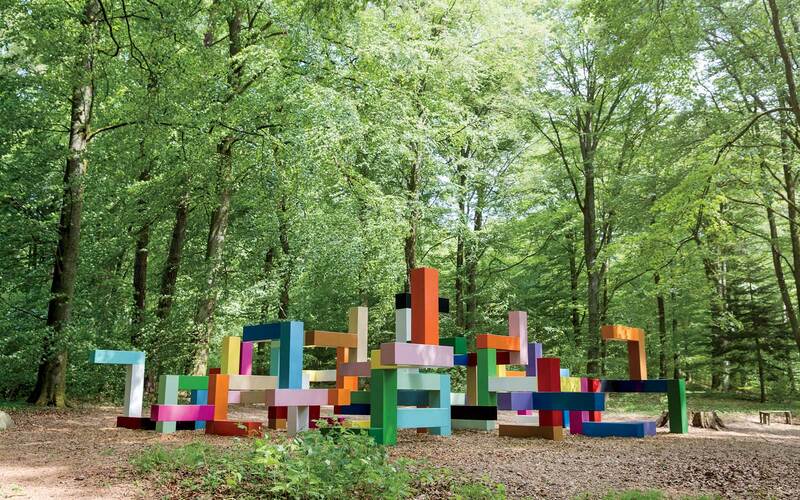 It's one of more than 70 works — including pieces by such celebrated names as Marina Abramović, Antony Gormley, and Dan Graham — that are scattered across a remarkable 100-acre art park on the historic Wanås estate. Located just outside the village of Knislinge, Wanås makes for a perfect day trip from either Malmö (a 90-minute drive) or Copenhagen (two hours). With a history going back to at least 1440, the estate is home to numerous buildings in a mash-up of architectural styles. Anchoring it all is a 1560s step-gabled, Renaissance-style castle, which is anked by two wings added in the 18th century. Beyond those are several 19th-century farm buildings that today serve as art spaces, a shop, and — as of this spring — a modestly stylish 11-room inn and a restaurant serving up locally focused dishes that use ingredients from Wanås's own organic farm. Some 75,000 people visited this unusual cultural destination in 2016, and with the new restaurant and hotel, more are expected this year. Indeed, while we'd enjoyed glorious solitude during our walk in the forest, we emerged to find the restaurant's long, light-filled dining room buzzing. In the kitchen, cooks were washing wild greens they had foraged that morning for a salad with edible flowers and house-made gravlax. Meanwhile, in a nearby gallery, two dancers were preparing for a performance for young children beneath a fabric dome.Wanås has long been a pilgrimage site for art-world insiders, but most visitors don't fit that profile. Many are from the region: older couples, families with children, a few of the Syrian refugees who have been settled nearby. Everyone wanders the grounds freely, without any of the hesitancy you often see in big museums. Kids run around looking for art as if they are on a treasure hunt. "I think it's thrilling to discover art in nature," said Elisabeth Millqvist, who, along with her husband, Matthias Givell, is codirector of the foundation that oversees Wanås. "It makes you look more carefully. You wonder what is man-made and what is nature." 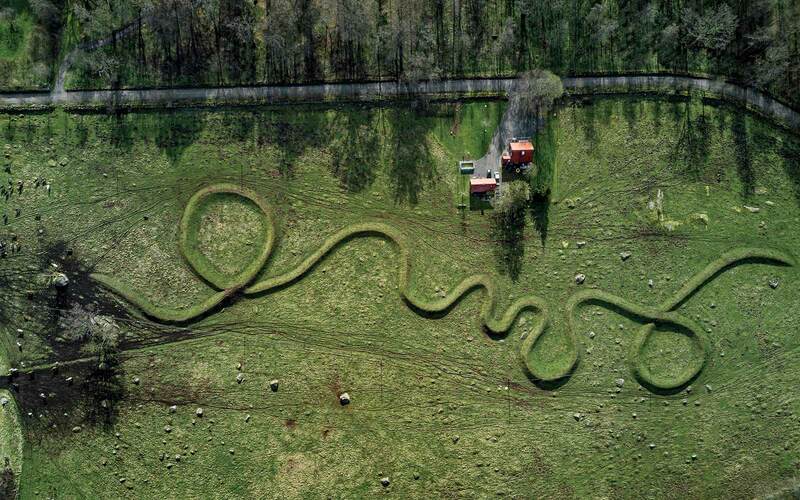 Maya Lin's earthwork Eleven Minute Mile squiggles across a cow pasture at Wanås, which is also one of Sweden's largest organic dairy farm. The labels are small and discreet at Wanås, and a big part of the joy of the place is the unfettered encounters with art that it offers. Heading into the gallery where rotating exhibitions are staged, I looked up and noticed, near the top of the gabled roof, two enormous overlapping clocks created by Lithuanian-born artist Esther Shalev-Gerz. One keeps real time, while the other has hands that go backward. My initial reaction was to interpret the work, titled Les Inséparables, as a commentary on regressive politics and culture. But then it occurred to me that a double clock is actually a perfect symbol for Wanås: a place that never forgets the past yet is moving toward the future; it's also a place where it is always time for art. The story of how Wanås became an art destination goes back to the mid 1980s, when Carl-Gustaf Wachtmeister and his wife, Marika, decided to settle down with their three sons (they later had a daughter) at the estate, which he'd inherited from his aristocratic family. Marika, who was born in Sweden but had spent her teenage years in Manhattan, was a successful lawyer in Östergötland, a region south of Stockholm, while Carl-Gustaf worked in forestry. For a cosmopolitan couple with an active social life, retreating to a grand rural estate seemed dauntingly outdated and lonely. "Moving to Wanås was quite difficult for us," Marika told me. To liven things up, she decided to pursue a budding passion by bringing contemporary art to Wanås. In 1987 she took time away from her law career and organized an exhibition at the estate (which has been open to the public since 1900), featuring 25 artists, most of them Nordic. "I just wrote them each a letter," Marika recalled, laughing at her own moxie. From the beginning, the project was a family affair. She enlisted her husband to cook for visiting artists, while her boys helped assemble artworks. The show was a hit, attracting record numbers of visitors to Wanås. So Marika just kept going. 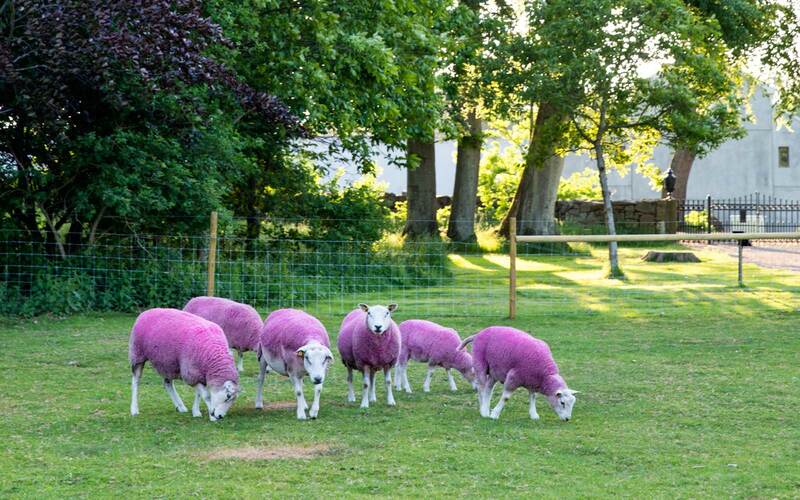 Dyed sheep that are part of the work Let Them Eat Cake, by artist Henrik Plenge Jakobsen. During the past three decades, Wanås has presented new shows almost every year, with some 350 artists exhibited to date. Early on, most pieces were installed temporarily in the castle's formal English garden. One exception was American artist Bernard Kirschenbaum's Cable Arc, which became the first work to enter the estate's permanent collection. Composed of a wire strung between two metal triangles across a pond, the minimalist piece subtly sags and tightens with changes in temperature, and its location behind the garden extended the physical boundaries of where art was shown at Wanås. The art program officially ventured off-piste in the early 90s when German sculptor Gloria Friedmann sought to put her piece, Stigma — a massive curved metal wall painted a jolting shade of red — deep in the forest next to an old oak tree. The Wachtmeisters hesitated because it meant draining the area and resurfacing a road so it could be accessed, but soon they agreed. "Our motto from the beginning has been ‘The artist is always right,'"Marika explained as we talked in the sitting room of the castle, which is off-limits to visitors. "If an artist wants sixty tons of concrete you'd better get sixty tons of concrete." Jacob Dahlgren's Primary Structure plays off the surrounding forest. As Wanås became better known, more high-pro le artists began taking on site-specific commissions. Many of them visited the property for inspiration, and they would often spend weeks installing their pieces. Fascinated by the ritual of the estate's deer hunts, Abramović created The Hunt Chair for Animal Spirits, a towering metal chair embellished with antlers, and installed it in an overgrown field. Maya Lin placed her land-art piece Eleven Minute Line, a squiggly grass-covered berm, in an active cow pasture. Jenny Holzer carved hundreds of her truisms — witty philosophical and political one-liners — into the old stones that surround the property; the text is so small that you often have to squat to read it. Some artists, joked Carl-Gustaf, have been so entranced by their surroundings they didn't want to leave. He recounted how German artist Stefan Wewerka, who created a small stepped bridge over a stream," finished his work early but stayed on for a week, cooking soups and broths for us." Kids run around Wanås looking for art as if they are on a treasure hunt. While Marika was spearheading the world-class art park, Carl-Gustaf was modernizing the estate's farm, which had focused on livestock, milk production, and forestry for centuries. Most of the locals thought he was crazy when he decided to convert to organic dairy farming. Today Wanås is one of the biggest such farms in Sweden. In the early 2000s Carl-Gustaf had a new cow barn built — a striking Modernist concrete structure, featuring an imposing triangular façade, that looks more like a church or a museum. "The new barn was inspired by the art," Carl-Gustaf told me, and I immediately thought of American artist Jene Highstein's Grey Clam, a monumental, bivalve-shaped concrete platform tucked among beech trees in the forest. "We asked ourselves, why can't we make a farm building that is beautiful? We were inspired by the artists to do something different, to take risks." At the same time, they began converting old farm buildings into spaces for art. One five-story barn was given over entirely to Ann Hamilton's sprawling masterpiece Lignum. Using all five floors like a tapestry, the artist wove together sound and sculptural elements that refer to the history of the building, the estate, and the region. One floor is filled with carved wooden tables; another has cotton threads stretched from beam to beam, forming loomlike screens. 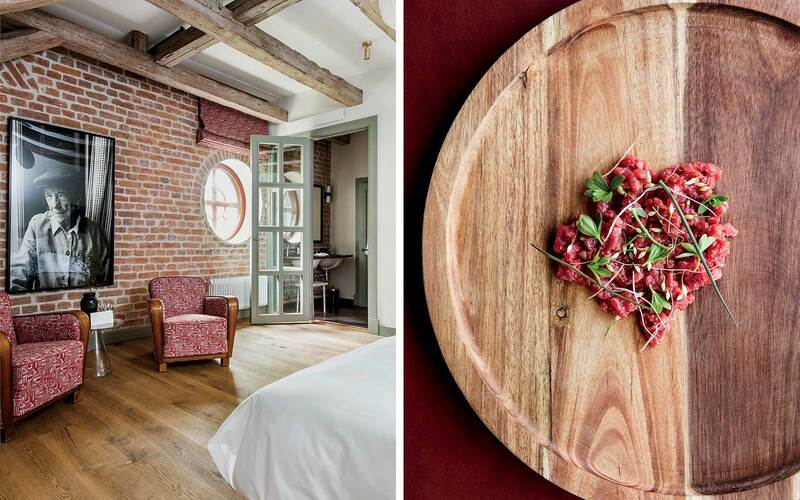 From left: Original ceiling beams were preserved in a hotel guest room; steak tartare at the Wanås restaurant. The latest phase of development at Wanås — the new restaurant and hotel — has been overseen by Marika and Carl-Gustaf's oldest son, Baltzar. Four years ago, he and his wife, Kristina, moved here with their four young girls to take over management of the estate, making the couple the eighth generation of Wachtmeisters to run the place. Kristina, an architect who interned under Rem Koolhaas, designed the restaurant interior and the hotel guest rooms, incorporating family heirlooms, vintage pieces, and furniture she commissioned from local artisans that uses wood and leather from Wanås. With no hospitality experience, she did extensive research and reached out to some of Sweden's best talents, seeking advice from Jeanette Mix, owner of the Stockholm boutique hotel Ett Hem, and chefs Magnus Nilsson and Mathias Dahlgren. "Mathias gave us some great advice," Kristina recalled. "He said we shouldn't worry about fine dining and instead find a signature dish that everyone dreams about, whether it's our cardamom buns or the tartare made from the farm's own beef. Whatever it is, people eating here should wake up the next morning thinking about that dish." She added, "For me that dish is our soft ice cream, which we make exclusively from the milk of our own cows." That morning she had her daughters collect wild violets to put on top of the ice cream. 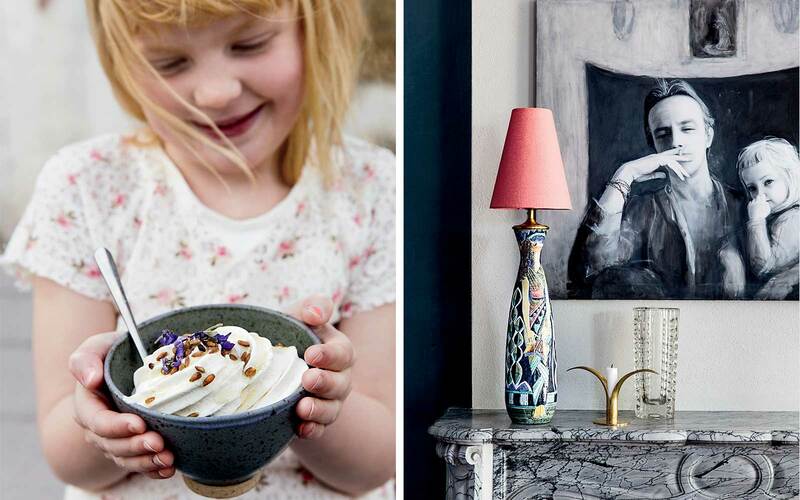 From left: House-made ice cream sprinkled with popped rye and violets, held by one of the girls from the Wachmeister family; a painting by Ylva Ogland hangs above the mantlepiece in the Wanås hotel's sitting area. Just as art has no borders at Wanås, neither will the restaurant. "For the most part, we will serve our dishes in the restaurant, but we are thinking about making picnics for guests to take with them into the park," Kristina said. According to Baltzar, the secret to Wanås's success has been its openness. "With many of these old estates there were codes, and modern ways tended to be frowned upon," he explained. "Properties were typically closed off and kept for the family. But my parents showed what a great journey it could be if we opened up the estate to contemporary culture and the rest of the world." 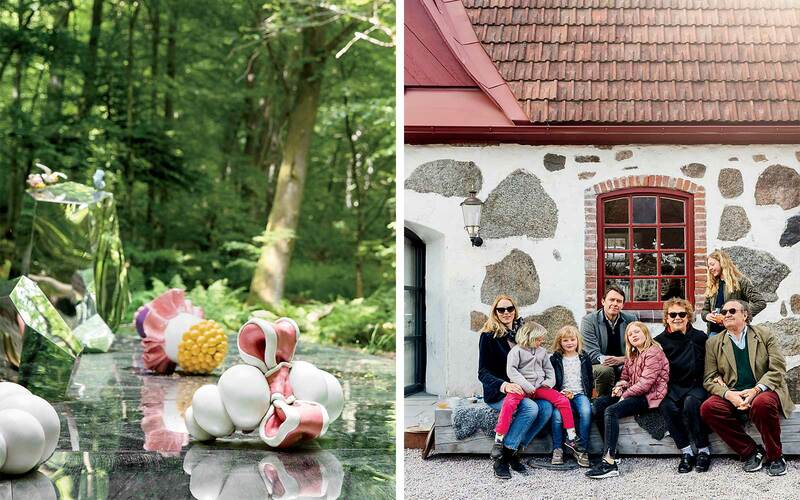 From left: Nathalie Djurberg and Hans Berg's installation In Dreams, on the wooded grounds of the Wanås estate, in southern Sweden; three generations of Wachmeisters. Throughout his childhood, Baltzar and his brothers were exposed to artists from numerous countries. "They were always curious and fun and a bit crazy," he said, laughing. "It meant that my brothers and I had regular contact with alcohol and cigarettes." He can recount dinners with Abramović, and the late artist Jason Rhoades was a friend. "One day at school," he recalled, "the principal called me in to say that I had to leave school early to pick up Christo and Jeanne-Claude at the airport." And now Baltzar would like his daughters to grow up in a similarly inspiring environment. Without the creative spirit that defines Wanås, Baltzar noted, he and Kristina would have found it difficult to move here. "We were fortunate to have been given this inheritance," he said. "While some people could find it a burden, we want to continue to make Wanås as interesting as we can, both for us and for others." With the family having overseen this land for centuries, Baltzar tries to take a long-term view. "I hope," he said, "that in another eight generations the family will be happy with what we have added to Wanås." Located on Sweden's southern tip, outside the village of Knislinge, the Wanås estate is a 90-minute drive from Malmö and two hours from Copenhagen. Wanås Hotel: Occupying 18th-century stables, this recently opened 11-room inn is outfitted with a stylish mix of locally crafted wood-and-leather furnishings and Midcentury Modern pieces. doubles from $199. Wanås Restaurant: Located in a barn across from the hotel, the restaurant serves meals in a light- filled dining room that has an assortment of communal wooden tables. Working in an open kitchen, chef Mathias Klingemann prepares seasonal Nordic dishes, including braised lamb with pickled fennel and sunflower seeds. tasting menu $66. Wanås Konst: More than 70 artworks are scattered across the property's 100 acres, so give your- self a few hours to see them all. Don't miss Ann Hamilton's Lignum, which occupies all five floors of a former farm building, and two multisensory installations in the forest: Nathalie Djurberg and Hans Berg's In Dreams and Robert Wilson's A House for Edwin Denby.